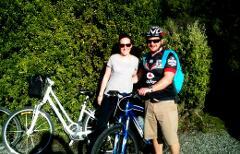 Spend a fun and enjoyable few hours biking through the Marlborough wine region with one of our friendly guides. Enjoy tasting Marlborough's distinctive wines from 3 wineries, as well as learning about the wines and the wine industry. Morning Guided Biking tour with afternoon self guided. Spend the morning with your friendly and knowledgeable guide, biking to 3 wineries learning and tasting plenty along the way. You'll keep your bike for the afternoon and continue your wine adventure on your own. Have a full day of fun biking to between 5- 6 Marlborough wineries tasting zesty Sauvignon Blanc, smooth Pinot Noir and fruity aromatics with your friendly, experienced guide while learning about the wines and the history of the area. This private tour offers you the premium Marlborough wine experience. Visit at least 5 of Marlborough's boutique wineries including a wine experience at one of them.The cycling is flat and easy and suitable for all fitness levels.